Let’s face it: you put a lot of time, efforts, and dollars into landscaping to make your yard a haven for social gatherings or just relaxing. Even though you are technically outdoors, you may not want all the inhabitants of the outdoors to join your party, or even worse, damage the hard work you put into landscaping planets. Rabbits, squirrels, gophers, deers, and birds are just a few of the wildlife critters that can wreck havoc on your landscaping, including your vegetable garden and flowerbeds. Keep reading for these wildlife repellent tips to protect your landscaping from your Denver landscaping service! One of the very first things you can do to protect your landscaping, if your budget allows, is to install a fence. 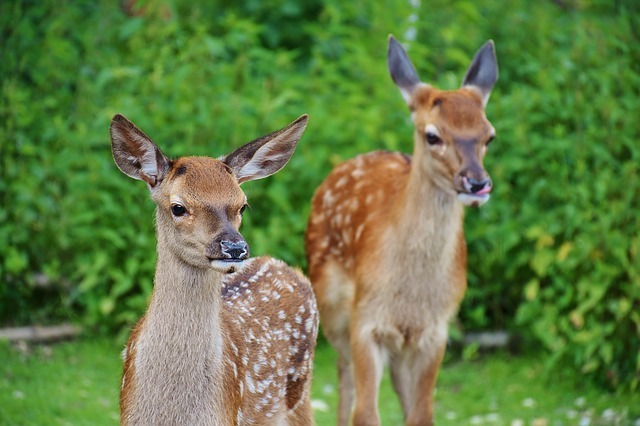 Fences are one of the easiest ways to keep neighborhood animals and wildlife such as deer, away from your yard. Taller fences will be required for deer, as they can jump higher than you think, while shorter ones should do just fine around your vegetable garden if rabbits are your main threat. You can even raise your flowerbeds or garden up and then put mesh or a short fence around the top of the beds for additional protection. If you aren’t keen on the way fencing looks, or simply don’t have the budget for it, there are several other options you can go with. When you plant bulbs in your garden or flowerbed, cover them up with an old heavy cloth until they are ready to bloom. Any type of digging wildlife won’t want to, or be able to, dig through the cloth to eat your bulbs. If you have fruit-bearing plants, cover them up with garden mesh so birds won’t be able to get to the fruit. Additionally, be sure to pick the fruit right when it’s ripe so deer won’t be able to smell that fresh produce is ready and waiting for them in your landscaping. Before you begin landscaping, talk with your landscaping professional to determine what kind of plants you can plant that will not only be attractive, but also help at deterring wildlife. For example, sage or lavender is appealing to the eye and nose, but not for skunks, squirrels, and deer who do not like the smell. Catmint is also great as rats, mice, and squirrels, do not like the smell of it either. You can use these plants as a protective border around others, or even your garden. Finally, while it may not seem like it, putting birdfeeders and squirrel feeders away from your garden but in your yard will actually help prevent wildlife from going into your garden to get food. The birds and squirrels can eat the food intended for them, as opposed to the food you’re trying to grow for your own family. While these a just a few ideas on how you can repel wildlife from your landscaping, there are so many other options. Check out 20 ways to keep deer out of your yard. Additionally, read up on our very own tips to protect your lawn from animals and pests. At Water Solutions Company, we have years of experience in landscaping, and are here for you every step of the way. Contact us today to see how we can help you with your Denver landscaping needs!